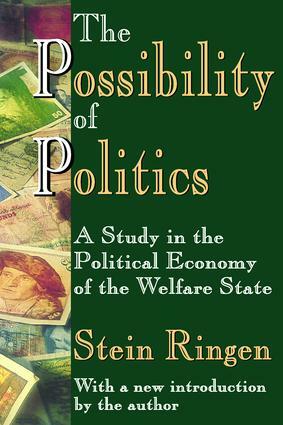 The Possibility of Politics explores the power of political reform, specifically reform of the modern welfare state. Can reform be effective if limited to cautious and piecemeal interventions that avoid radicalism and revolution? Can it also avoid unwanted consequences? Will the welfare state survive in the future?Stein Ringen views the welfare state as a large-scale experiment in political reform. To ask if the welfare state works is to ask if political reform is possible at all. By its nature, the welfare state is reform on a grand scale, for it attempts to change the circumstances individuals and families live under without changing and disrupting society itself. But is it realistic to believe a population can get together, set goals and then try to meet these goals through collective actions, specifically public policies, without causing unintended consequences and destroying the state in the process? The welfare state attempts, idealistically, to redistribute welfare without reshaping the economic processes that cause inequities in the first place. Ringen considers how well redistribution has met the test in terms of political legitimacy, its intended effects on poverty and inequality, as well as its undesired and unintended effects on economic efficiency and the quality of private life. Ultimately, does the welfare state work? Further, is the welfare state a good thing?In considering these questions, The Possibility of Politics should be of particular value to academics and advanced students interested in political theory, public economics, social administration, and political sociology.Stein Ringen is professor of sociology and social policy at Oxford University and a Fellow of Green College. He teaches social and political theory and research methodology for graduates in social policy, sociology, politics, economic and social history and other subjects.